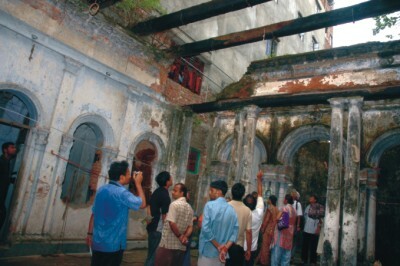 On the July 8 the people of Shakhari Bazaar woke up with a sense of anticipation; some eminent scholars and social leaders would be visiting Shakhari Bazaar. They would be coming to meet the people of Shakhari Bazaar and get a a deeper understanding of their hopes and problems. Certainly the problems of this historic community, the oldest surviving one at that, actually seem endless and have multiplied over the decades. It has pushed the community into a perennial state of helplessness. Even amidst all the problems, we can't take our eyes off the most important aspect of the mohalla. It is the heritage factor. Living at the same place as their ancestors did for the last 500 years, the members of the Shakhari community have been practicing the same craft that their ancestors did, with equal dedication and devotion, maintaining the same exquisite quality, while making their trade economically viable. With their habitats, lifestyle and their craft, this community of Shakhari has become a living heritage of old Dhaka. Prof. Nazrul Islam, delivering the concluding speech. Shakhari Bazaar is also a proud custodian of a built heritage that spans over three centuries beginning with the late Mughal through the Colonial period. It is one of the most important links to the history of Dhaka. Beset with an endless list of problems, the people of Shakhari Bazaar languish in a state of limbo. These include vested Property Act, prohibitive import tariffs on the raw materials of Shankha Shilpa, deep rooted poverty, absence of conservation and so on. Discriminatory and distorted ownership and inheritance law, archaic urban policy and development control rules, lack of utilities and services, irrational import policy, total absence of any form of social support, all have had their cumulative effect. The Shakhari's right to own property is denied; they don't have the right to inherit and their right to earn an honest living is denied by distorted import policies. One problem has bred a number of others. 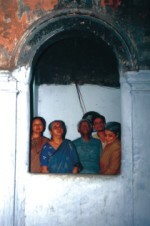 The official denial of the ownership right has created a host of other problems, lack of maintenance and repair, which ultimately led to the dilapidated appearance of the mohalla. It has resulted in the widely prevailing lack of access to utilities and services. Prof. Muntasir Mamun addressing the community. If the people of Shakhari Bazaar already knew why, such distinguished guests were coming to visit them, they definitely didn't have the faintest idea, about how sincerely they would try to find out their problems and exchange views with them. It is a long way to go but a very promising beginning indeed. It will help to keep the dream alive--the dream of a city, emanating a sense of place, where the people live, work and grow; where they bring up their children; where its citizens “belong”. The Campaign for Heritage Conservation and Urban Study Group arranged the event called “Meet the Community”, held at Shakhari Bazaar, on July 8, as part of an awareness building programme. The members of the campaign visited Shakhari Bazaar, went around the mohalla, went inside a few houses and and met the members of the community, including the Panchayet committee of Shakhari Bazaar and exchanged views. The event concluded with a press briefing. Campaign members look at the details of House no. 47. 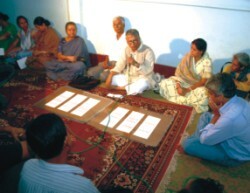 USG (Urban Study Group) is a voluntary organisation, formed by a group of architects. 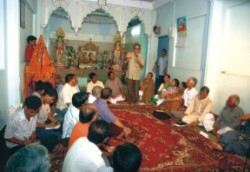 Involved in action research, it has been campaigning for the Conservation of Shakhari Bazaar since June 2004.